Patrols are to be stepped up at Brighouse Cemetery as Calderdale Council looks to clamp down on irresponsible dog owners. 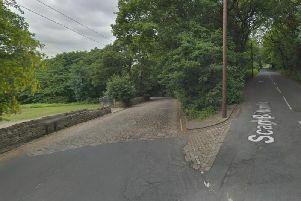 A number of complaints have been made to the council about the cemetery on Lightcliffe Road about the number of dogs off their leads and fouling in the grounds. In a crackdown, fines have been issued to dog walkers with the council prepared to do more to catch more culprits flaunting the dog orders. Calderdale Council’s Deputy Leader, Councillor Barry Collins, said: “We do everything we can to keep our cemeteries clean and safe. “All council cemeteries are subject to dog control orders which require dogs to be kept on a lead at all times and dog owners are required to clean up if their dog has fouled. “The Dog Warden Service has received a number of complaints regarding alleged offences of dog fouling and dogs being off their leads in Brighouse Cemetery. “Officers have patrolled the cemetery on several occasions, and will continue to do so at various times of the day and night. “In June, three dog walkers were caught by officers from Environmental Health with their dogs off their lead in the cemetery. “Each was served with an £80 Fixed Penalty Notice. Two of the three fines have been paid, and the other is pending prosecution. “We won’t hesitate to get tough on this, and we start court proceedings if fines aren’t paid within 14 days. Dog Control Orders came into force in Calderdale in September 2012. The five Orders relate to the control of dogs in outdoor spaces that are accessible to the public, and the requirement for dog owners to clean up forthwith after their dog has fouled. Owners who do not comply with any of the dog control orders could be served with one or more Fixed penalty notices. The Fixed Penalty is £80 and must be paid within 14 days to avoid prosecution. If found guilty of an offence, a person could be fined a maximum of £1000. The Fixed Penalty is reduced to £50 if paid within 10 days. To report a breach of these Orders email customer.first@calderdale.gov.uk or call 01422 288001.